Please, spend some time educating yourself before taking the leap to buy a puppy- remember, this is a family member, that you will be spending many years with. You may hear from other places that show-bred Malamutes are not bred for good temperament. This is totally false! ANY quality breeder of dogs makes temperament a top priority when selecting the parents to be bred! While the top show dogs ARE often those that have a little more "snap" in the ring, temperament towards people, especially in Malamutes, is crucial- people often do not understand that it takes a good-natured dog to stand there in a strange place while a perfect stranger looks into their mouth, grasps their head, feels their ears, and then proceeds to squeeze and prod the entirety of the dog's body! My own admittedly firm opinion is that if the dog cannot tolerate this, they do not belong in that ring. It does take a "tough" dog to make a great working dog- but this does NOT have to mean an aggressive dog, just one with a lot of determination and "heart". SHOW or PET? What makes a good breeder? You may also hear that "show breeders" put down puppies that aren't good enough to show, or they put down long coats, or mis-marked puppies. NOT TRUE! Quality, ETHICAL breeders care VERY deeply about each and every puppy, and want only the best possible home for ALL of them! Most of our puppies we place in homes as "pets", and they have just as good a chance of excelling in working or performance events as the pups we keep for our own show and breeding programs. Does the breeder require return of the puppy, should you no longer want or are able to keep it, for the entirety of it's life?? Does the breeder require meeting their puppy buyers in person, often more than once, and want to know them well before deciding if they'll sell them a puppy? Will the breeder offer lifelong support to you & your puppy? If you feel like the breeder is putting you through the third degree before deciding if they'll sell you a puppy...good! That means they probably care a lot about where their puppies go! Please use caution: there are many "breeders" out there, producing litter after litter after litter, without a care whether the home is suitable, without a care as to how those puppies will develop. The first thing to look at, whether the breeder you are looking to get a puppy from breeds for show puppies or not, are HEALTH CLEARANCES- have both parents been Xrayed for Hip- and maybe even Elbow- Dysplasia, and those results registered with the Orthopedic Foundation for Animals (OFA)?- alternately, this may have been done by PennHip. If they had a "prelim" test done young, has that been followed up properly with official testing after the age of 2? Have their eyes been checked for any genetic disorder by a veterinary Opthalmologist? These results in the past were registered with the Canine Eye Registry Foundation (CERF), you may also now find them registered with OFA. However, at minimum you should be able to see and verify the original veterinary report. Look up the pedigrees through AKC and ask around. Having these health clearances on the parents lessens (it does not eliminate) the risk of the puppies developing these problems- but your breeder should be using all of the tools available to try their hardest to produce healthy pups. Like all dogs (including mixed breeds), Malamutes have their share of hereditary disorders, and we have to continue to contribute and participate with those organizations who are researching them, always digging for answers as to how genetics or other factors can cause or create diseases. All adult dogs owned by us have participated in at least one blood draw for research, with their information stored in the OFA's DNA databank. With the more recently developed DNA test for Alaskan Malamute Polyneuropathy, we are utilizing that tool- we are fortunate that all of our dogs are clear of the gene for this inherited and deadly disorder. PLEASE look into this disease and the clearances! Are the parents (and consequently the puppies) registered with the American Kennel Club (AKC)? The only registration Clubs I am aware of that truly are registering PUREBRED Malamutes in THIS country (USA) are the AKC, and you may find dogs registered with the Canadian Kennel Club or the United Kennel Club - however, any animal registered with UKC is likely to also be registered with one of the first two. I'd be suspicious if they are not. Other "registries" exist that will register any dog, regardless of parentage, or even in the lack of known parentage- so puppies resulting from these dogs may or may not be purebred, or the parents may have been bred even though they were sold on a spay/neuter contract or with Limited Registration (which would make that "breeder" pretty unethical, IMO). NO good, responsible breeder sells purebred puppies without papers!! Good breeders try to breed to our Standard- there is a natural variation of size within the breed, however, no natural Malamute in history was ever useful on a sled team (remember the Malamutes original purpose was as a freighting dog, heavy loads over LONG distances, all day, at likely a trot) that weighed much in excess of 120 pounds, and even that is pretty extreme for a working sled dog. It does happen that even in today's show lines, here & there a puppy will be produced who is WAY larger than expected! But this is not the intent of the breeding, nor a marketing tool or bragging right. Extremely large, heavy dogs generally cannot keep up on a sled team- even a recreational one- their extra size makes them too heavy to have much endurance (yes, I've seen this), and they have a difficult time breaking trail in deep snow. They are often good at weight pulling, and if that's what you want and like to do with your dogs, they'll do just fine- go right ahead and pursue that activity and have fun with it! IF you want a sledding or packing dog, or want to try performance events, you'll likely need a dog that is closer to the breed standard- even my 26" dog has a hard time maneuvering through some Rally and agility courses- though he is a wonderful sled dog, he's just too big to be able to easily change direction at speed. Some larger Mals can do agility events fine- like my big guy, they'll likely not be real competitive in advanced levels, but may certainly be able to do it and have fun- which is the whole point, right? Like any large breed, they'll need to be kept lean to avoid putting too much stress on their joints. Breeding for only one major trait often causes the loss of other traits- whether it's breeding for size, or only considering temperament without considering structure, or breeding for heavy coats, or whatever it is-the WHOLE dog needs to be considered in breeding. If a very large dog still meets the standard in coat, structure, head shape, etc; well okay then! And there are some very nice-looking, lovely-tempered Giant Malamutes out there- there are also very poor ones, that even disregarding size, don't have the structure or head shape to really look like a Malamute- there are even those that look cross-bred. These are likely from breeders who are only considering size when breeding, rather than structure; overall structure, soundness, health, and temperament should be the first considerations in breeding- equally! Malamutes, remember, should be able to move with a clean, reaching, effortless and tireless gait- they should certainly look as though they could motor across the snow all day long! I don't believe all breeders need to be aiming to breed show dogs- but their dogs should be built correctly, and look like the ideal that the breed standard describes, regardless of size. Also, if they are not "proving" their dogs in some PUBLIC way: working events, or companion events are good options other than the show ring- then how can they really know they are breeding dogs of quality? All dogs can be great on their home turf, how do they stack up in public? Can they keep working even after the novelty wears off? A Malamute with a wonderful temperament but poor structure, whose parents were bred because of their lovely temperaments even though they had that same poor structure, may make a good pet...until the owners decide they want to start, for instance, hiking with their dog on a regular basis. For a while, all may be fine- but as the dog keeps working his body, the badly-angled joints will wear and break down, and eventually will cause him pain and irreversible damage- which will often be shown as "grouchiness" (or even worse) in the formerly-happy dog's demeanor! Structure is VERY important in the performance rings as well- agility dogs do a great deal of jumping and turning while running very fast! Poor shoulder and front leg structure will cause them injury and a very early retirement. Poor rear structure will affect their abilities as much. 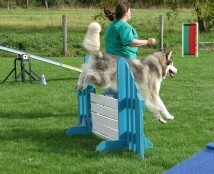 Advanced Obedience dogs must also jump, often higher than in agility- again, structure matters! For more insight and understanding of these issues, please read this excellent article, and visit the Canine Sports Productions website for more information. No OFA/PennHip certification for Hips- ask to SEE the certifications; and remember that you also want to see the rating- not just any vet can accurately read a hip Xray, and just because the parents have "never had a problem" doesn't mean anything- dogs, particularly Malamutes, are very good at masking pain. Claiming "show-quality" puppies, when the puppy parents are not Champions, nor are the grandparents, etc..and the "breeder" is not involved in showing dogs. How would they know?? Even experienced breeders take weeks and months to evaluate show prospects, who do not always turn out to be show quality. Breeders purposely producing "wooly" or long coat puppies are NOT breeding for the good of the breed- they're breeding for money. Wooly coats are a FAULT, they occur often enough in breeding, but reputable breeders are not TRYING to produce them, they just happen when two carriers of this recessive (and harmless) gene both pass that gene on. These pups are almost always placed as pets, while their normal-coated siblings are kept for show and maybe future breeding- IF they turn out to be high enough quality, structurally. Most reputable kennels produce longcoat puppies at some point or another, and are happy to have qualified pet homes ready to take on the extra care and grooming this coat requires. Only very rarely does a reputable breeder keep a long coated puppy for their breeding program- and only if that puppy proves to have superior build, temperament and health. HUGE prices!! Why pay high figures for a puppy out of non-proven (in the show ring or working venues) parents??? Especially if they lack health certifications...many less-desirable "breeders" are cashing in on the available now, just send in your money, first-come first-served attitude...Reputable breeders often have a waiting list, and usually match the puppy to the correct home environment. But really- it is rare for reputable breeders, with health-tested, working and/or show ring titled dogs, usually with proven excellent temperaments, to charge over $1200-1500 in the USA for a pet puppy. PLEASE be patient, choose a breeder whom you like, dogs you like, ask questions, learn about the breed, get on a waiting list, and be willing to wait for that right pup. Higher prices for "Rare" colors or mismarked or piebald/spotted?? No color is worth more than another in Malamutes, they are all equal. Red is absolutely not rare! White is less common, but occurs in certain pedigrees, as do certain other colors not seen quite as often. But they are not worth more. Any breeder purposely producing "non-acceptable" or faulted colors is NOT breeding for anything except to produce something they can charge more money for. Lack of involvement in the dog world: no breed club memberships, no kennel club memberships, no working or show or performance titles on their dogs. Reputable breeders do NOT sell "breeding rights"...it's not even a consideration. Whether a pup will be bred down the road is not something to determine until full maturity, as only the very best of any good breeders' kennel are used to produce the next generation. Those puppies not destined for a qualified show home are sold on a spay/neuter agreement and limited registration. Oh yeah- advertising payment by credit card or paypal!! Breeding litter after litter to the exact same parents, both sire & dam owned by the "breeder"...these are not people breeding to improve their breed or their breeding program, but only breeding to make money. Repeat breedings are only rarely done by reputable breeders, and only if the offspring were completely exceptional in either working ability or the show ring, or both- or if the breeder did not get the puppy they wanted to keep- say, they wanted a female puppy from this particular breeding, and only got boys. Testimonials on their website: tells me it's a business to them and they are trying to out-sell their competition. As does .biz in their web address, or worse yet, certification from the Better Business Bureau! Hello, breeding purely for profit?? ​Most of all- observe the surroundings that breeders' dogs are living in- look for cleanliness, well groomed dogs, shiny coats...overall, happy, healthy dogs given every chance to live a fulfilling life.